After telling people that I like the architecture of Provo’s original LDS Temple, I typically draw quizzical looks. It’s an unusual building, and often an unloved building. But Monday, residents will get a chance to learn a little bit more about this unique and rare example of Mormon modernism. At 2 p.m., BYU’s HBLL Library will host a Founders Day Lecture titled “Temple Architecture for a Modern Age: The 40th Anniversary of the Provo Temple.” The lecture will take place in the L. Tom Perry Special Collections Classroom. 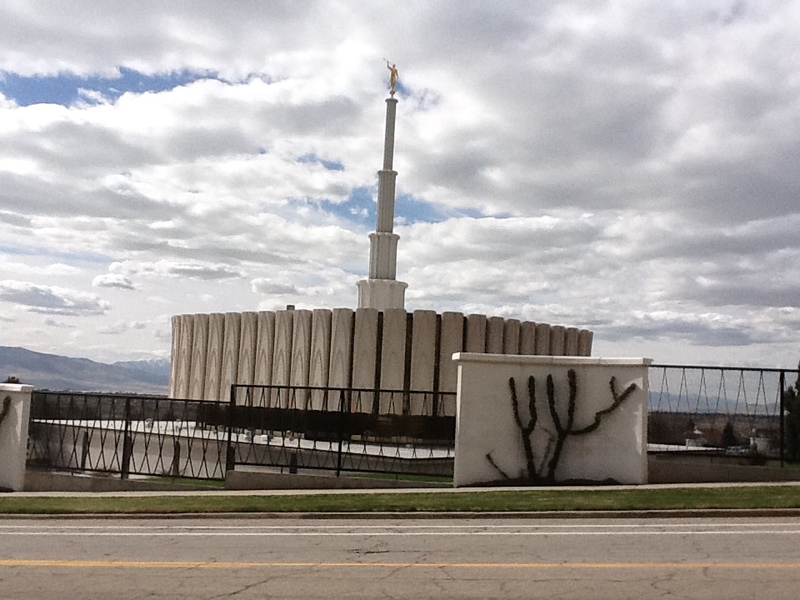 When the Ogden and Provo Temples were dedicated in 1972 they were unlike any temples that had preceded them. The two temples introduced a new way of doing temple work and a new concept in how a temple might look. Over time their design has proved to be controversial, but after 40 years it is possible to look back and better understand the historical significance and architectural value of these buildings. As [it] is the lone survivor of the “twin” temples, the Provo Temple stands today as a unique and beloved landmark in Utah Valley. I truly hope the Provo Temple is preserved over the next few years, and not stripped down and made to look like a suburban cookie-cutter temple, as is happening in Ogden. The Provo Temple is certainly not the most attractive Mormon building in the world — nor is it the least attractive — but it is one of the most unique and represents an important moment in the history of the church and the city. As Provo grows up, this building also is something that gives flavor to the region and that can be appreciated by its increasingly diverse populace. The lecture will be held in the L. Tom Perry Special Collections classroom in BYU's library. What Can We Do With Our Malls If (When) They Fail? The scale and scope of the project would be breathtaking in its own right. But what makes Xanadu extraordinary is the fact that it is emerging just as the American mall—that most quintessential of American institutions—is in its dying throes, if not already dead. Moribund malls have not gone unnoticed amongst industry analysts and Web sites like Deadmalls.com that feature photos of hundreds of now-abandoned sites. But what were once just worrying signs appear to have finally flat-lined. That’s a description that could certainly apply to City Creek. But more importantly on the hyper-local level, what does it mean for the malls in Utah County? I’ve written before that I believe Provo’s Towne Center Mall is better poised to succeed long-term than Orem’s University Mall. I’m more and more convinced of that fact all the time — not because I like Provo’s mall better but rather because Provo seems better managed and Orem seems to be a victim of circumstance. But long term, will either mall survive? I truly can’t imagine how. Neither mall is particularly successful. Neither is in a particularly good location. And the investment going into both cities, and especially Provo, is directed to other areas. I have no idea what will happen in the future to the malls in Utah County, but it’d be wise to start thinking about what will replace them in a generation or less. Waning desire for cars and car-travel among Millennials has been the big story lately in the news and was the topic of a recent post on this blog. But a similar phenomenon is also occurring among the aging Baby Boomers, though for different reasons. This AP article reports on the growing concern among experts that as Baby Boomers get older, fewer and fewer will be able to get around. Basically, a massive generation of Americans are going to be too old to drive. Yet at the same time, many of them live in cities that will essentially trap them. Transportation usually tops the list of unmet needs in local aging-agency surveys, advocates say. Public transit routes and stops sometimes aren’t flexible enough; volunteer transportation networks are popping up in a few places but remain rare. As Baby Boomers age they'll need more walkable communities that require less driving. Coincidentally, that's also the same thing younger people want. Like many communities, Provo is likely ill-equipped to serve its aging Baby Boomers. That means either their quality of life will significantly decrease as they drive less, or they’ll simply move to senior communities. Either way, that’s a loss for the city. The solutions to this problem are neither mysterious nor unattainable. What’s more, they also appeal to both the old and the young alike. Although the task looms large, communities that address these issues now could reap benefits that reach beyond the Boomer bubble. Creative planners like to envision neighborhoods that appeal to those who are young and old. Young people actually have similar tastes to seniors when looking for a place to live, coveting walkable communities with easy access to shopping, entertainment and transit. And Boomers want affordable and accessible housing, transportation, recreation options and, when the time comes, in-home care and services to help them avoid nursing homes. New rankings from the Brookings Institute have Provo among the 20 cities leading the U.S. out of the recession. In January, a similar report listed Provo among the best cities for economic recovery, but these new rankings include data through the end of 2011. 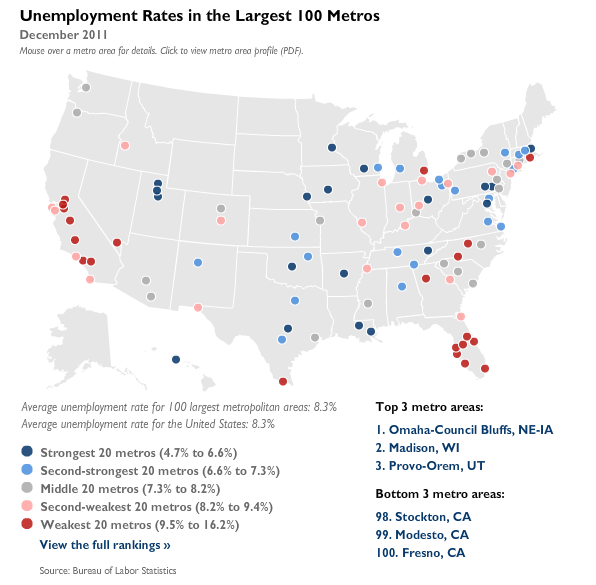 For example, Provo now has the third best, or lowest, unemployment rate in the entire country. It’s the fourth best place in the U.S. for jobs, and it climbed to 36th best gross metropolitan product (GMP) from 49th (out of 100). What does all this mean? For starters, Provo’s economy apparently is charging ahead at a faster clip that elsewhere in America. This Atlantic Cities article also compares the 100 biggest metro areas’ statuses in 2009 and in 2011. In 2009, Provo was a lower-tier city, but in 2011 it was one of the strongest. That’s a remarkable change in a very short amount of time, and one that many people may not have stopped to consider; I think most of us can remember what we were doing just three years ago, but in just the blink of an eye Provo has become a relative dynamo. That the Provo metro area is being grouped with Austin and Raleigh and being called a “high-productivity knowledge base” is quite remarkable considering it’s smaller size and relative historical obscurity. Those other two cities are also state capitals, so Provo is managing to compete despite a relative disadvantage in government jobs and spending. *It’s curious that the author threw in that parenthetical note about Provo in that quote. Provo frequently shows up in these rankings but the fact that it needed additional explanation suggests that it may be overlooked, misunderstood or underrepresented. This is kind of late in the evening, but I just wanted to mention the picnic tonight. First, I wanted to thanks Susan Krueger-Barber for the wonderful flyer she made, and for all her other efforts. Also, I wanted to thank everyone else who came and participated. It was a great time with old and new friends. And that’s one of the things that makes Provo so great: an amazing community, great spaces, and a cool spring evening for them to converge in. What’s significant about that fact, however, is that the recession has apparently driven young people to seek cool cities. Young, educated workers are frequently described as one of the most integral parts of a successful city’s economy. They propel growth, innovation and entrepreneurialism. But this new information shows that a city’s vibe, something I’ve also referred to as “mystique,” also matters. “Audio-Files” is a new show that apparently will air on BYUTV, and perhaps online as well. I believe it is produced by the same people who did the Occidental Saloon videos, which were genuinely amazing. It will also feature native Utah musicians such as Joshua James, those with a strong connection to the area such as Imagine Dragons, and perhaps others. Additional information online is somewhat scarce at this point, but tonight the show is having a special screening at BYU. Attendees are required to register to get in and the screening is labeled as a “BYU Student Screening.” However, I’m not a BYU student and I just registered, so it appears that anyone with the will to attend can manage to do so. There are screenings at 6 pm and 8 pm, but I recommend attending the 8 pm screening so you can also go to the community picnic at the tabernacle. And finally, the development of this program provides a case study in how the arts — and specifically Provo’s music scene — can grow from something small to a major asset in the community. Not only is local music a pleasure, but a show like “Audio-Files” shows that it’s growing to become a major cultural and economic force beyond the limits of its historical niche audience. This is the sort of thing that generates positive buzz, as well as economic development. I happen to love Provo music simply because I think it’s great, but for all the reasons mentioned above I hope the community supports this program and the cultural movement that produced it. Visit the “Audio-Files” Youtube channel by clicking here.